Below is a month-by-month list of flies and patterns. In general, you'll find success with stimulators, stoneflies, caddis flies, bead-head nymphs and streamers. If you're a spin-caster, try your brown or gold rooster tails, Panther-Martens, red-and-black daredevil, green spoons and Mepps. We encourage the use of single barbless hooks and catch-and-release fishing even in areas where regulations allow you to keep fish. These Idaho rivers run free of dams. High water comes from mid-May to early June each year as warm water brings torrential flows out of the mountains. It's a great time for whitewater rafting, but not so good for fly fishing. Wait until mid-June when flows subside for the best fishing. During the heat of summer, early and late in the day is usually more productive. During the cooler fall and winter months, fishing is best during the midday hours, when the water temperatures are warmer and insect activity peaks. Hatches of giant salmon fly happen and the fish are aggressive. The same patterns as above work well. Grasshoppers and ants should be added to your mix of patterns. As mentioned above, we don't recommend fishing the Middle Fork Clearwater at this time of year. But the Lochsa can still be productive, especially further upstream. Beautiful fall colors and cooler weather make for very pleasant fishing conditions. Cooler weather and streamer fishing can be productive. Suggested patterns include: Serendipity, Wooly Bugger, Parachute Adams, Black Gnat, Griffith's Gnat and V-Rib Chironomid. Cooler water, but same patterns as October should work well. The river is closed during December. We guarantee that you'll learn something new to help you become a better fisherman after one of our trips. We will offer a full refund if we don't meet your expectations! Our Rocky Mountain Angler Package is designed to provide you with time and money savings! 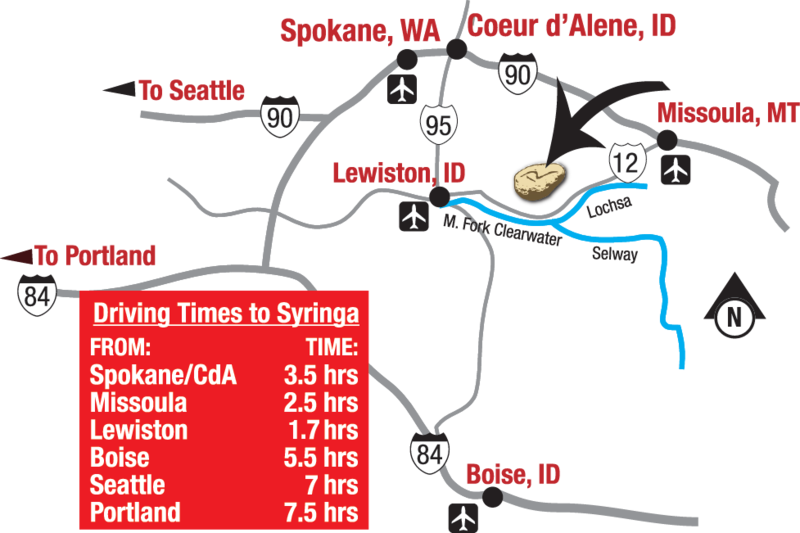 These packages include your private cabin at the River Dance Lodge, gourmet meals at the Syringa Cafe and guided fishing trips on the Clearwater or Selway Rivers. Anglers who prefer to fish on their own will find plenty of great fly fishing waters nearby, including the fabulous Lochsa River. We've complied a list of our favorite spots. Our guides have plenty of experience on the water and have put together a list of recommend flies and lures for you. If you are taking a guided trip, all flies and lures are included. Fishing on your own? Feel free to take a look at our recommendations.